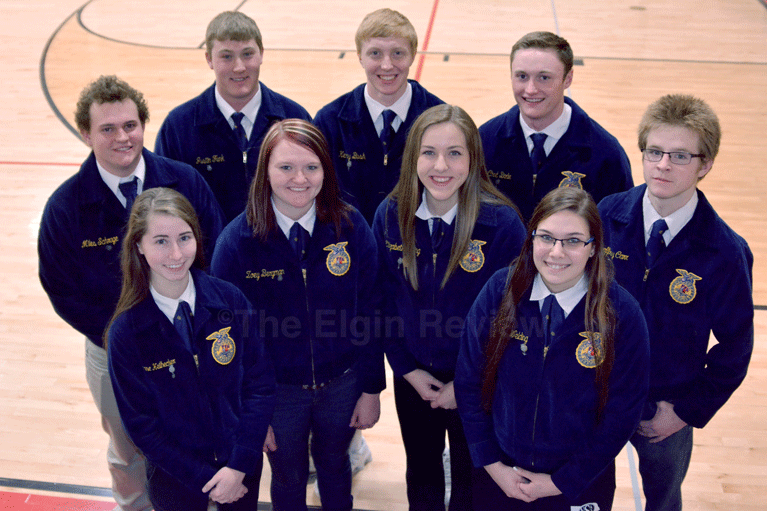 Nine members of the Elgin FFA Chapter will be in the spotlight in April when the FFA State Convention is held in LIncoln. It was announced last week that Kenny Bush, Kelsey Welding, Elianne Heilhecker, Zoey Bergman, Geoffrey Carr, Chad Bode, Justin Funk, Miles Schrage and Elizabeth Selting will receive their State FFA Degrees. According to FFA Advisor Julia Schwartz, the State FFA Degree is the highest degree the state association can bestow upon a member. Each year members are awarded the degree based upon their comprehensive Supervised Agricultural Experience Program. FFA members must submit two years of SAE record books, complete the State FFA Degree application and meet all minimum qualifications as well as pass a test in order to be awarded the State FFA Degree. FFA members who have outstanding SAE programs may apply to be a State Star in Production, Agribusiness, Placement or Agriscience. Twenty-four individuals are selected to be finalists each year and one Star is named in each of the four areas. On another FFA note, Bode’s and Funk’s record books/applications have also been selected to move onto the state level for the FFA State Star Farmer in Placement Award. Chad’s Diversified Ag Production Proficiency was second district gold while Justin’s Grain Production Proficiency was district first gold. FFA Chapter President Marie Meis’ Ag Communication Proficiency was district first gold and will move onto state.